For the last few years, if I am going anywhere where roaming data is expensive, or unavailable, I've used my venerable Nokia N73 and Bluetooth GPS. Its a solution that generally 'just works'. In the last couple of years Nokia have released and improved the previously Windows only versions to include new OSX versions of the Multimedia Transfer and Map Loader applications. In fact in the current Map Loader they event got rid of my one annoyance which was you didn't know what was already on the phone, so if in doubt you would delete what was on there and re-download. Must have consumed loads of Nokia bandwidth. 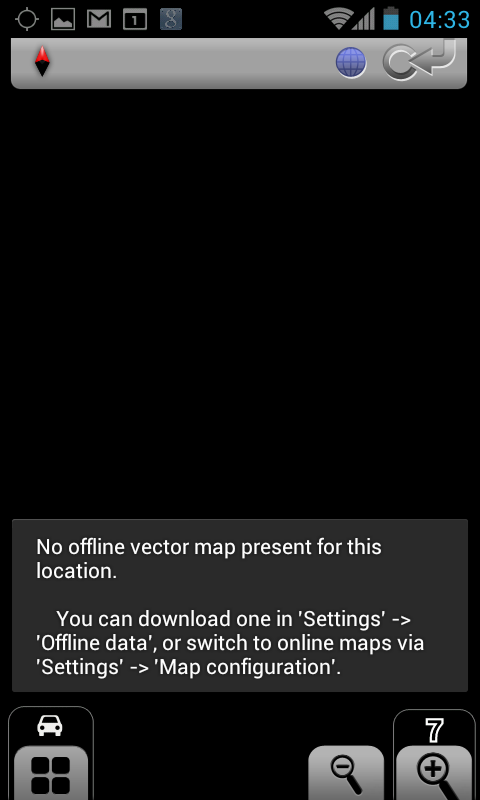 Anyway, with a forthcoming trip to a place where roaming data would be stupidly expensive or unavailable, I decided to look at offline mapping applications, and my first point of call was for my Nexus S.
First I looked at the Google Maps Android and its pre-cache feature. Its not immediately obvious how to use it. 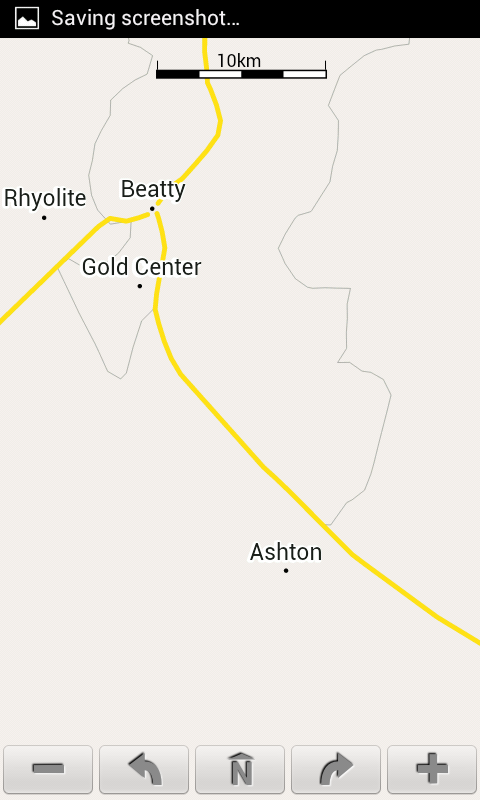 Eventually I worked out that its best to either find on just move the map to get to to general area, then long press. It should find something interesting where you just pressed, and then you can press the right arrow thingy and scroll down till you get to cache . The problem is that it can only cache 10 miles, which is you are going to, say Death Valley, just doesn't cut it. You can cache more than 1 area, but its tedious to do a lot. It does kind of work so it survives the first cut. Maverick: I didn't really 'get' Maverick. There's no 'my location' button. 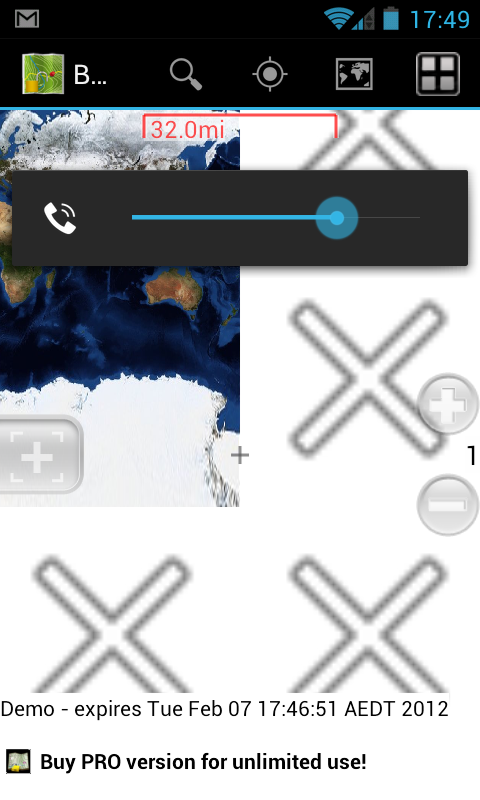 You need an external app, Mobile Atlas Creator to get download maps in advance. Sorry, doesn't survive the first cut, and get deleted. BackCountry Navigator: I never got this to even load properly. Nope, doesn't survive the first cut, and is deleted. Maps (-). I just don't know if I'm using this app correctly. It seems like it has a straight forward interface. 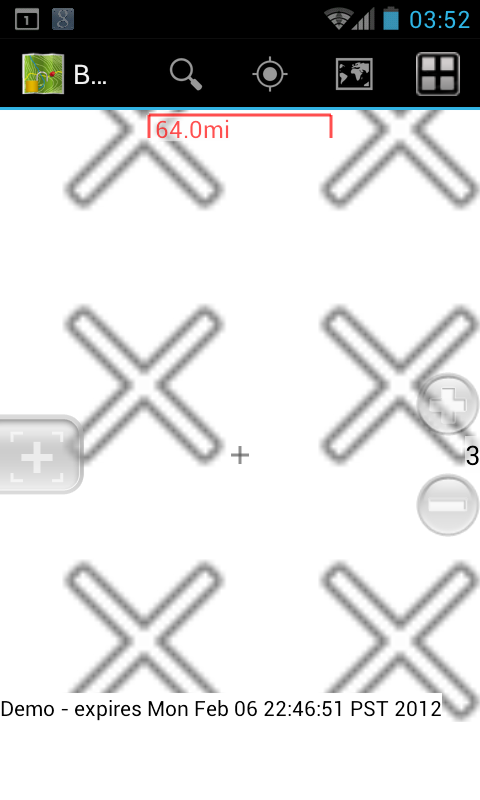 I press the menu button and then cache area, and then click on zoom levels. Ahh but which ones did I select? I don't know. The main screen spends a lot of time being blank, in fact at one point I even saw maps disappear from the screen, wrong way I would have thought - as the caching continues, the display clears. I can't even give you a link to this because the name doesn't allow searching. On the left, looking OK, the slightest zoom out on the right, and gone! By the skin of its teeth it survives the first cut but only because it has the minimum promise. OSMAnd was actually the first Android Offline mapper I tried, and to be honest I thought I would have to look no further. The map download method works OK, its vector maps so they aren't very big, and the map display is OK. So why did I end up looking at other solutions? Well the version in the Market initially, did not retrieve tiles correctly from cache. Then just days ago, it got an update, and the cache issue seems resolved. 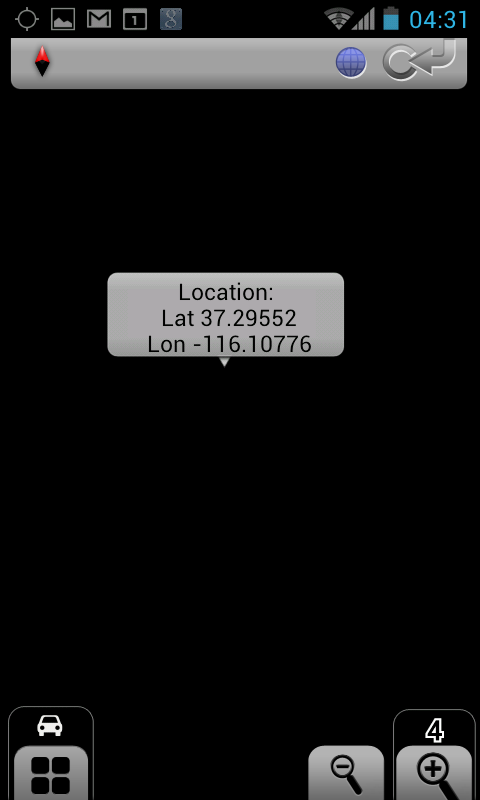 It still has other small-ish quirks, such as showing a black screen, when map data should be available. 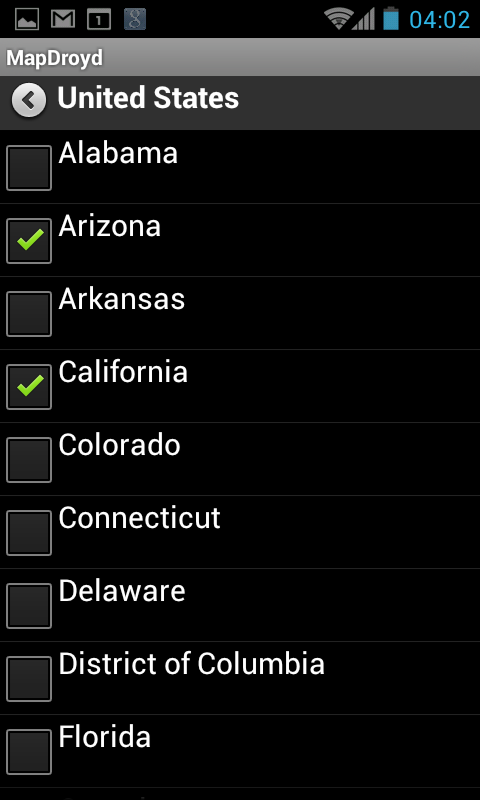 In the example below I downloaded California, so why go black at zoom 6? Shows promise, so survives the first cut. Nokia N73 released towards the end of 2006 ie over 5 years ago. If you're going to USA then copilot is quite cheap; far far cheaper than the one with UK/Eu maps. It's a shame that TomTom doesn't come on android. 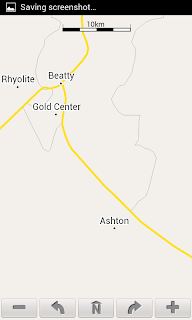 Given that TomTom is, or at least used to be, a linux app then I am surprised they haven't tried porting it. One day I plan to try and repeat the progress that people made hacking TomTom to run on the Zaurus - google for "zomtom"
p.s. google for "zomtom zaurus"